Are you constantly getting weird aches in your instep while playing? You might not have the right kind of shape in your soccer cleats. This could be due to the arches in your feet. You may have flat feet and never knew it. If that’s the case, check out our review of the best soccer cleats for flat feet. Finding the correct sports shoes can be difficult. There are different specifications required for each sport. Soccer cleats are no different. If you have flat feet, you should be even more selective when looking for the best cleat for your foot. 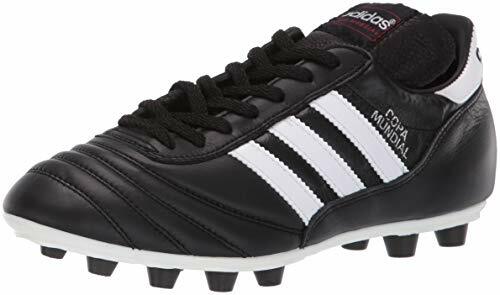 Everywhere you look for soccer cleat recommendations, the Adidas Copa Mundial is almost never missing in action. It’s often the top pick for almost every category of soccer cleats. This means it has reached beyond what it was intended to be. The Copa Mundial is inarguably a comfortable cleat proven by many players, both professional and casual. The very classic and nostalgic old-school design is easily recognized. For flat-footed players, the the reinforced heel panel or leather support extending from the heel is the feature that most helps their abnormal feet positioning. It provides an increased stability and balance that can protect the heel and prevent it from rolling inwards too much. It’s also not made with synthetic leather. This boot is made with real, soft kangaroo leather that not only cushions the foot, but molds itself to it. It has a die-cut EVA insole and an equally studded outsole that’s made to step on firm grounds. The Copa Mundial is meant to be supportive, especially along the arch on the inside. It stays firm and unyielding on the outside. Though the soft material is known to abide by your foot’s natural shape, this one still has preventive measures to ensure your feet won’t fall inwardly. There isn’t the danger of overpronated feet. The dual-density outsole also lessens the impact on the arch where flat-footed people might need the most support and cushioning on. Dream Pairs Fashion Cleats are a big surprise that will exceed your expectations! For its price, it seems like the kind of soccer cleats that just does the job but offers nothing more than what it’s intended for. However, that’s not the case at all with this pair. This cleat may not be at the level of the infamous Copa Mundial, but they’re surprisingly level with other cleats in terms of serving almost perfectly, at least in the features that it does have. First off, the features that it has for flat feet are the sock-like ankle collar, rounded toe, and its engineered internal support system. The interior is designed and molded to create the most supportive arch support for flat feet. This means it’s not too high nor too flat to result in foot pain. Simultaneously, the shape of the inside is shaped to the natural contours of the foot. Note that it doesn’t mean the natural overpronation that’s common among flat-footed people, but the natural shape of the feet as it should be with the neutral heel and mid-arch. It also cradles the heel at the back to further support this function. On the other end, the shoes feature a reinforced rounded toe to prevent the forefoot from collapsing towards the side of the instep. It literally enforces the foot to stay in a seamless round position in front. Overall, this cleat leaves little room for your overpronated feet to go back to its leaning position. The sock-fit ankle collar seals in the feet into what the other two features have put them into. 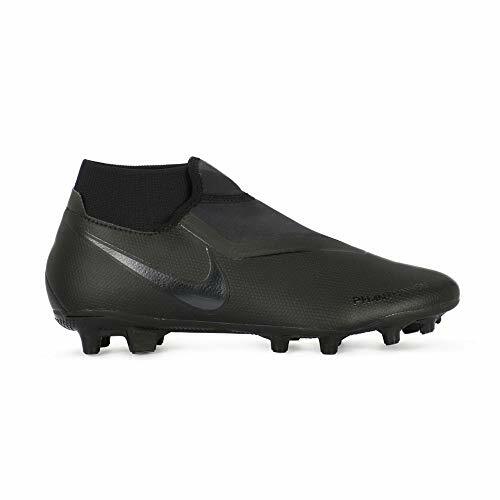 It’s not necessarily like the mid-cut cleat like the previous option, but the collar reaches further up the ankles than your ordinary low-cut soccer cleat, providing support where you need. 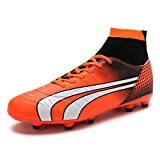 Additionally, this soccer cleat for flat feet is also made for random bursts of speed that will help you perform quick cuts and thunder-like runs as the game requires. Its anti-skid outsole is made for various surfaces both for natural grass, regardless if damp or dry, and synthetic turf. At first glance, the immediate feature that will catch your eye about the adidas Men’s Freak X Carbon Mid Football Shoe is its mid cut. It’s less popular than its low cut counterpart, but it’s the type of soccer cleats that prove to be good for players with flat feet. The mid cut opening covers the ankle up to the lowest part of the leg in a cushion. This offers the ability to correct toe drift or any other type of deformity or abnormal stance that flat feet causes. The extended opening on the ankles also ensure you have good stability and support, which resolves a problematic gait. It has a sock-like fit that preludes the same snug fit on the vamp and the forefoot. 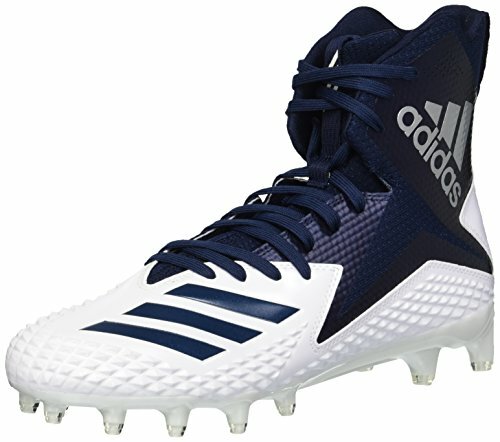 On the latter parts of the cleats, it has very adjustable laces which you can customize. If you ever require an orthotic insole insert or just have wider feet along with having flat feet this will accommodate. On the forefoot, there’s an Ironskin toe cap that protects your toes and the front part of the feet from taking on too much tension. The Freak x Carbon mid cleat might not have the leather heel support of the previous shoe. But, it offers something as much if not better: cushioning in the Achilles tendon area. This is where the toe drift is most visually obvious. The cushioning ensures it’s not strained while playing. It also corrects the heel to be in a more neutral position rather than leaning towards the inside of the feet. With 6 inches of wiggle room across the shaft, this shoe is not only for flat-footed people. It’s also accommodating enough for players with wide feet. Having both at the same time is not uncommon to people who have one or the other. This wide shoe will be helpful for flat-footed people nevertheless. 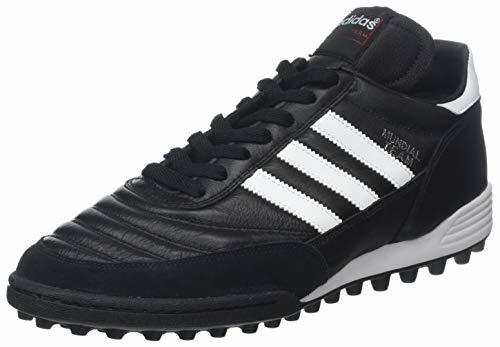 The adidas Performance Men’s Mundial Team looks a lot like the first Adidas pair, only a different iteration. This cleat looks more like a casual sneaker more than a soccer cleat. This bodes well for players who aren’t too keen on the look of professional cleats. A major differing feature of this Mundial from the other is the wedge outsole. Inside it translates into a curved insole that can stand as a substitute to the orthotic insole separates. It’s shaped so that it cradles your heel at the back. Simultaneously, the wedge lifts it up a bit as the rest of the insole is sloping downwards, creating a subtle arch support in the middle, specifically just in the instep area. This helps the cause of people with flat feet as this type of sole is the shape they need to reinforce a natural shape instead of falling victim to the negative effects of overpronation. It has cushioning in places you need it from, like in the no-chafe heel counter, insole, and even on the inside of the vamp. The die-cut EVA lining itself is a molded synthetic lining that’s made for maximum lightweight cushioning and comfort. Everything else seems almost the same as the first Mundial. The upper is a mix of both layered leather and smooth suede, providing the textured surface needed for accurate kicks. Meanwhile, the studded outsole is made with Traxion to provide grip on all sides and directions. This cleat can serve as an general cleat for flat feet players who don’t necessarily have a permanent position in the game and perform different skills and purpose as needed by the team. First off, the Nike Phantom Vision Academy is a sleek sight to behold! Its intro all-black colorway is a design Nike rarely has. Other colorway options are also groundbreaking for the brand’s selection of soccer cleats, design-wise. Look closely at the shoe from the outside. See exactly where the material of the upper meets the outsole. You’ll notice that it’s slightly higher on the heel, curves down immediately, and then the rest of the sole is flat going to the front. You can see it on the other colorway options where the two are colored differently. This is what makes it suitable for players with flat feet. The slightly elevated heel protects it and puts it in a position that follows the proper pronation of the feet. It also provides the opportunity for a slight arch support that people with flat feet need. This reinforces an arch where they don’t have any. It’s a smart and innovative move for Nike for integrating design to simultaneously perform function. The straight and narrow shaft doesn’t provide much room to move in, securing your feet in a locked-in neutral stance. All the while, the fabric sleeve around the ankles act like a sock for a snugly tight fit. This Dynamic Fit ankle collar also allowed for a Ghost Lacing System, which makes this cleat serve a consistent fit. Despite the firm and unforgiving appearance of the cleats from the outside, a significant number of people have been surprised of its comfortability. This Nike number is an exceptional cleat as it can also play well in surfaces like natural grass and artificial turf. Having flat feet means a person has very low or no arch at all on the instep of their feet. The entirety of the bottom of the feet either touches the ground at all times in any position or the instep falls flat on the ground in certain stances. Flat feet, also called pes planus, is apparently a “postural deformity” wherein the arches of the foot don’t develop. Having flat feet is normal and natural in children, but the arches tend to grow higher in puberty up until adulthood. People who’ve grown with their arches still flat or low to the floor are probably the ones who can be considered flat-footed people for certain. As mentioned, flat feet can either be a perpetual state of having feet flat on the ground in any position or arched feet whose arches tend to disappear in specific stances. A supple flat foot is more of the latter. Supple flat feet is when an arch can be seen in certain positions, most especially when the feet are not flat on any surface. However, they become a supple flat feet when the arch flattens onto the ground when it touches. Having supple flat feet can also be distinguished as just a partial collapse of the instep or the partial loss of the arch. Another characteristic of a flat foot is called a toe drift. It is when the “heel tilts toward the outside and the ankle appears to turn in.” Visually, it would look as if the feet are collapsing or leaning inwards or toward the instep instead of just being flat straight down. This is also called overpronation and is the term you’ll likely encounter more when buying soccer cleats. Pronation is the regular movement of the feet from side to side when walking or running. It can also be the degree of leaning your feet assumes inwards when standing. Overpronation is just the excessive amount of rolling inwards that your feet are naturally used to. It’s even less common because this only affects a few flat-footed people. But, it’s something soccer players need to be aware of and take into consideration when looking for soccer cleats. By the appearance of them, you’d think majority of soccer cleats are made for flat feet because of the flat outsole that’s common to many. What those kinds of shoes don’t show though, is the inside where there’s usually a contoured insole for high arch support. Many other features will immediately kick some cleats off the selection of soccer cleats for flat feet. These considerations are not only suitable, sometimes they’re the only solutions so flat-footed players can play better. These prevent the aches that might occur without the right support. The insole is the main part of the shoes that connects with your arch or instep. If there’s only one thing that you need to look out for when buying soccer cleats for flat feet, it’s the insole. Its flexibility plays a major part in making sure your feet feels comfortable inside the shoes. Not only that, soccer cleats’ insoles are usually required to be well-padded for a bouncy effect that will lessen the effort needed to be exerted in your gait. The easiest way to know that a soccer cleat is for players with flat feet is when orthotic technology is incorporated into the insoles. You can also get separate orthotic insoles as a replacement to be put inside your regular soccer cleat. Orthotic shoe insoles are mindfully shaped and designed to put a support system on the arch and lift them up a bit. This kind of insole is made with soft cushioning to arrange the feet in the normal way with an arch just enough to not make you feel like your feet are at an unnatural positioning. Having flat feet is a cause for some pain, discomfort and other issues with the feet and leg area. Overpronation itself can cause a lot of strain on not only the instep, but also the heels, ankles, and legs. Orthotic insoles have the power to prevent or reverse these painful effects from the excessive rolling of the heel and arch inwards. While some soccer cleats may feature really high arch or no arch support at all, orthotic insoles fall in the middle of the range and offers a little bit of arch support without overdoing it. You might think just because flat-footed people have really low or no arch at all, they’d require absolutely no arch support. That’s where most people get it wrong and you might be one of them. Don’t make the mistake of getting cleats or separate insoles that have no arch support! Your instep should be lifted at least to a small degree to put less strain on the other parts of the lower body that might be affected, sometimes even including the hips. Simultaneous to the arch support should be the deep heel cradle that protects your heels from leaning inwards too much. The two features help each other to reverse or at least lessen the severity of overpronation. Everyone could probably understand how comfortably fitted shoes should feel. As for soccer cleats for flat feet, it’s so much more than just feeling like your feet are on a cloud. A snug fit, which is a common description as well, is also not enough to distinguish a comfortable cleat for flat-footed people. A good indicator of a comfortable fit is the when the insole of the cleats help realign your joints from the heel to the toes. This might mean that your feet should assume the position of regular feet with an arch. This prevents you from incurring pain on the feet or any part of the lower body. A shock absorption quality increases the vertical flexibility of the cleats or the insoles. This means your feet will receive less impact as the shoes will take the brunt of it when you walk or run. For a high intensity or high impact sport like soccer, this is a helpful feature because it preserves your energy which you can then transfer or focus onto other things in the game or in your playing style. Wide feet are common among flat-footed people too. This doubles the number of features you have to consider when choosing soccer cleats. However, wide shoes are infinitely better for any flat-footed player because it provides more room for a separate insole should you need one, which is a recommendation you’d be better to take. As in its description, flat feet are considered a deformation most of the time. It comes with its own set of negative effects. This is true when not taken into account for shoes like soccer cleats that follow a certain set of features to be considered comfortable. Constant pain is a symptom you might mistake for overuse of the feet, either by standing, walking, or running too long, especially since you do all while playing soccer. Simply resting won’t resolve this issue and continuous ignorance of your feet’s overpronation might result in more grave consequences. When you have flat feet, the impact that the arch is supposed to be taking is transferred to other parts, specifically the rest of the foot, heel, and ankle. They will have to work double to stabilize your body and balance out your stance. This is the reason for foot fatigue. The extra work that other parts of your feet does makes them more susceptible to being overused, causing some normal aches and eventually numbness that can translate to full-blown pain later on. This tissue is called the plantar fascia, hence the name. This can feel like there’s a stabbing pain on your feet that can occur and reoccur at different intervals throughout the day. On normal feet, the plantar fascia supports the arch of the feet. Since flat feet have lesser or no arches, the plantar fascia is constantly stretched and probably torn from the high impact sport. Flat feet is a situation that needs to be addressed by soccer players who have it, especially since it’s less common than having merely wide feet. The consequences of ignoring it and not taking it into consideration are grave. However, these tips and soccer cleat selections are proven to help flat-footed players choose the best for their foot type.